There is little that you will see in post-Civil War Richmond that hasn’t been in some way influenced by Major Lewis Ginter or someone connected to him. In fact, I’d go so far as to say that he is the “Greatest Richmonder of All Time” and certainly my favorite historic figure in our city’s 400+ years of existence. Many in Richmond are familiar with Lewis Ginter Botanical Garden and the Ginter Park neighborhood in Northside — locations graced with his name. Fewer likely are aware of Ginter being the visionary and financier behind the creation of Richmond’s Northside, which in turn brought parks, railways and streetcars and the innovations born from those civic advancements. He was a fearless businessman — earning and losing several fortunes. Along the way he also gave away much of his life’s worth of financial gains to the southern city he loved. Few men in Richmond’s long history have done so much for the city’s advancement. 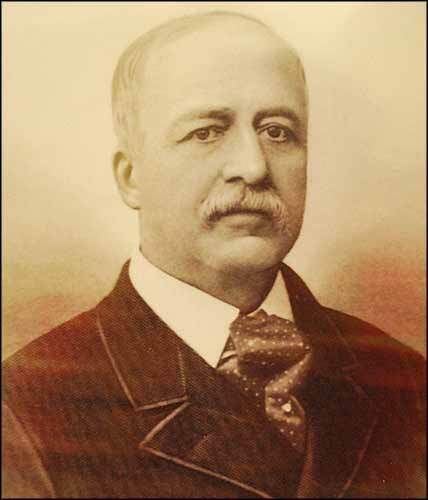 In 1890 when he was in the tobacco business, Ginter and partner John F. Allen merged with four other manufacturers: W. Duke, Sons and Company; William S. Kimball and Company; Kinney Tobacco; and Goodwin and company to form the American Tobacco Company — a forerunner of today’s Philip Morris USA. In 1892, financed construction of narrow-gauge railroads in Richmond’s Northside for hauling stone from his quarries at Young’s Pond (now Bryan Park) — spurring developement of the Richmond Locomotive Works. Personally financed and supervised construction of the majestic and perennial five-star Jefferson Hotel, which opened in 1895. In 1896, created Lakeside Park, which quickly became a streetcar destination for bicyclists and outdoor excursions. The area is now Jefferson-Lakeside Country Club. In 1897, Ginter’s Richmond Railway and Electric Company distinguished Richmond as the nation’s first city with an electric street car system. The company’s power plant was a precursor to today’s Dominion Virginia Power. Gifted land that eventually became for Richmond’s Joseph Bryan Park and also Northside’s Union Theological Seminary, when it moved from Hampden-Sydney College. Purchased the Richmond Daily Times newspaper — which he later gave to his attorney and friend Joseph Stewart Bryan. The paper eventually became the Richmond Times-Dispatch and was the beginnings of Media General Inc. He was also a very private man and there are few photos or accounts of his business transactions. Many more of his accomplishments and generous gestures likely went unnoticed or unrecorded. He shunned acknowledgements of his contributions to Richmond. He had no children of his own and left most of his money to his niece, Grace Arents, who turned her inheritance into many philanthropic endeavors herself (from Lewis Ginter’s Richmond and other sources). In 1901-1903, she funded and supervised construction of the St. Andrew’s Church Complex in Oregon Hill. Created the Instructional Visiting Nurse Association. In 1913, she bought the property of the abandoned Lakeside Wheel Club (created by Ginter), remodeled the structure to create Bloemendaal and made it a convalescent home for sick children from the city. Opened Grace Arents Free Library on Cherry Street in Oregon Hill and was said to read every book before it went into the library. Established the first playground in the city at Clark Springs. Upon her death in 1926, she willed life-rights of the Bloemendaal House in Lakeside to friend Mary Garland Smith and stipulated after Smith’s death the city of Richmond was to develop the property as a botanical garden honoring Lewis Ginter. In 1984, it opened as Lewis Ginter Botanical Garden. We will never again see an era in Richmond’s history where one man could make so many contributions and aid in the developement and advancement of the city. We should have long ago erected a statue in his honor.